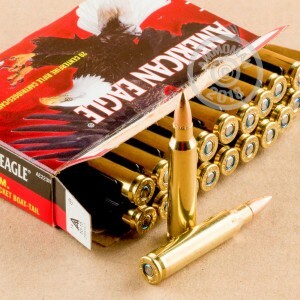 The 223 Remington is a wonderful round used all around the world. Due to its light weight, low recoil, and versatile applications, this round makes for a phenomenal civilian and military cartridge. The 223 Rem is great for hunting, self defense, range training and match shooting. 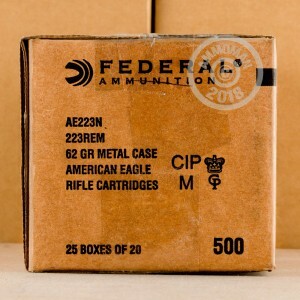 One of Federal's most popular lines of ammunition is the American Eagle line. Coming at a great price with the high quality components of Federal Premium, the American Eagle line is perfect for volume shooting at the range. 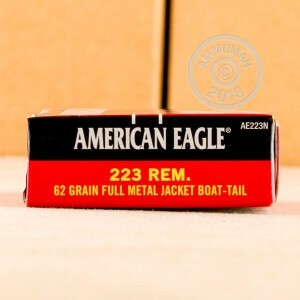 These 62 grain, full metal jacket rounds will perform flawlessly for you as you plink around and punch holes in paper. Do you need more than a couple boxes? At AmmoMan.com all orders over $99 will receive Free Shipping! So stock up on all you calibers and save!